Walkaround boats are typically used in offshore fishing. Walkaround boats are boats designed for offshore fishing. A number of boat manufacturers produce walkarounds, including custom boats which can be built to very particular specifications by request from customers who are willing to pay a premium for custom work. These boats can vary in size, and they are one among many options available to sport fishermen who plan on offshore fishing activities. The design of a walkaround boat includes a central cabin with berths for sleeping and a bathroom or head, although the boat lacks a galley for cooking. The cabin also includes the console, which holds all of the controls for the boat. A full deck wraps around the cabin, allowing people to walk around the boat with ease; walkarounds provide a great deal of flexibility for people using them for fishing, and they can also be used for brief excursions by people who are interested in taking a boat trip to take in the sights. Used walkaround boats are available in many ports, for costs which vary, depending on the boat, the condition, and the manufacturer. Buying used can be appealing for people who want a walkaround, but are not necessarily ready to pay for a brand new boat. New boats can be purchased from boat dealers or ordered from manufacturers. Buying new certainly has some advantages, including the ability to request custom modifications and the comfort of a warranty which will ensure that the boat will be repaired or replaced in the event of a problem. A number of trade publications provide reviews of new models, for people doing research on walkaround boats to prepare for a purchase. Back issues can be searched to find information about older models in the event that someone is looking at a used boat, and these magazines also often contain resources such as listings of used boats for sale by region. Walkaround boats are also available for rental. Boat rentals will usually ask for proof that someone is competent enough to handle the boat, and they will request a deposit in addition to a rental fee. Using a rental can save casual fishermen the cost of maintenance and berthing fees, allowing them access to a boat when they want one, without the effort involved in keeping a boat up. Rental boats are usually well-maintained for safety reasons, and a number of models are often available. Boat timeshares are also available for people who are not ready to bear the expense of keeping walkaround boats on their own. What is Boat Rental Insurance? 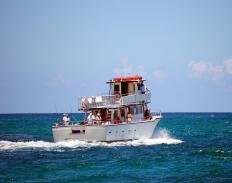 How do I Choose the Best Sport Fishing Boat?